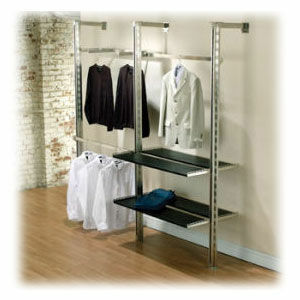 Displays mount to floor and walls around your retail store perimeter. Choose uprights either 96" or 120" high. Add shelves, hangbars, and faceouts to complete your display for your retail store. These wall displays coordinate with the other parts of the Pearl District system - Nesting Tables, 2 Way, and 3 Way floor display. Outrigger uprights are the frame used to create your perimeter display. Wall and floor mount kit is included. The 120" upright has 3" x 3" uprights and the 96" upright has 3" x 2" uprights. Choose the accessories to complete your display. • Shelf Brackets sold in pairs (left and right) and used with shelves sold in the 2 way and 3 way display section. • Faceouts are used with hangbars; 12" projection. • Outrigger Hangbar is made with 1 1/2" rectangular tube; for use with Hangbar brackets, sold separately. Available in 48" length with 4" or 12" projections. • Hangbar Brackets are sold in pairs (left and right); use to suspend Hangbar. Available in 4"
• Peghooks are used with Hangbar and are available in 6" and 10" projections.